UK defined-benefit pension funds tend to have liabilities linked to inflation, due to the contractual revaluation of benefit payments for active and deferred members each year, and the annual increases granted on pensions in payment. Historically this risk exposure to (rising) inflation, and inflation expectations, was one of the largest risks facing pension funds, which has over time led pension funds more and more to consider investing in assets linked to inflation in order to best hedge this risk. When a pension fund starts to build a hedge for its liabilities it quickly discovers a subtle but important feature of its liabilities, while inflation itself can (and has) been negative from one year to the next, in a lot of cases the pension benefits that are paid out cannot decrease from one year to the next. 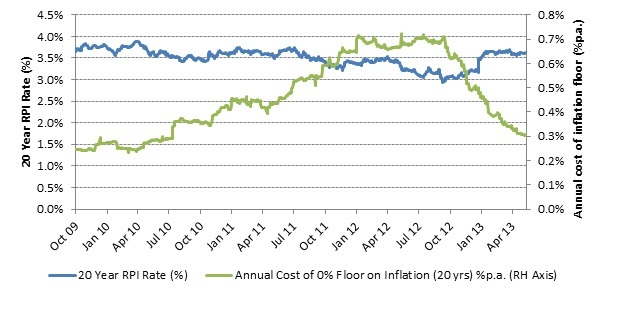 In the language of the capital markets, the benefits contain inflation floors at 0%. 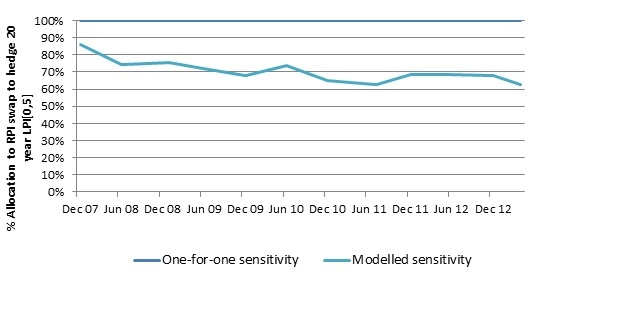 Most also contain caps on the annual increase of pensions payments at 3% or 5%. The presence of the floors changes the behaviour of the true market valuation of the liabilities, compared to a situation where the floor was not present. The theories relating to option pricing help us understand how, but the key outcome is that the change in value of the liability will not be quite “one-for-one” with changes in inflation, but somewhat less than one. To be even more precise, this relationship is not constant, and in mathematical terms is non-linear with respect to inflation. As a pension fund begins to build an inflation hedge from scratch, this level of detail is not paramount – the most important thing is acquiring more inflation hedging assets. 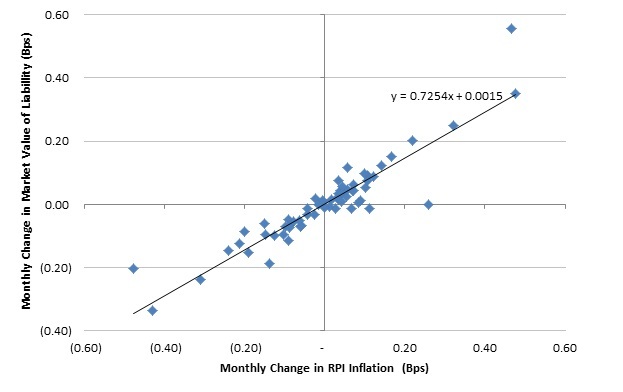 In order to match the behaviour of the liabilities with pure inflation instruments, a dynamic rebalancing approach needs to be adopted, which varies the exposure to inflation (RPI) instruments at any given times – in accordance with a particular model, and in response to changes in the level of inflation expectations. By doing this, schemes effectively monetize the difference between the implied level of inflation volatility (inherent in the floor pricing), and the realized inflation volatility (see figure 4 below). There have been several recent developments of relevance. When a scheme builds its inflation hedge, the effect of the inflation floors and caps in the benefits should be taken into account, and this becomes even more important as the inflation hedge ratio increases. Invest in pure inflation linked instruments (RPI swaps) and dynamically manage the exposure to best match the behaviour of the inflation floors. 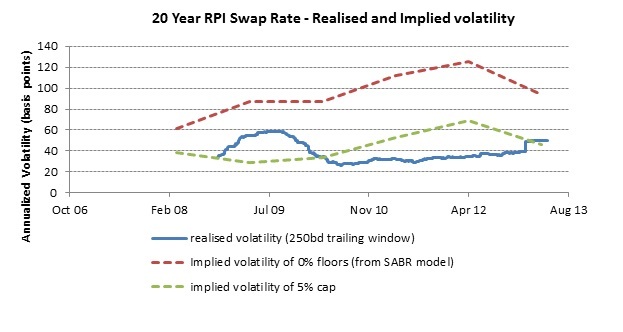 Care should be taken in the model used to calculate this rebalancing, but done successfully a scheme can effectively monetize the difference between the implied volatility of the floors and the realised volatility of inflation expectations.